Detail of "David's Punishment" by Julius Schnoor von Carolsfeld (German artist, 1794-1872), woodcut illustration in Das Buch der B�cher in Bilden. Larger image. From David, a lover of God and at the same time a terrible sinner, comes the most moving prayer for pardon in the Bible. If you've been burdened by sin and guilt, this prayer can serve as a model for you as you put your past behind you and move into a new place in God. I'm calling this a Prayer for Pardon instead of a Prayer of Confession for a couple of reasons. First, "Prayer of Confession" has a fixed place in our church traditions, thus it is harder to examine. Second, I believe that it is fully possible to pray a prayer of confession without faith. The beauty of David's prayer is that it is above all a bold Prayer for Pardon in which he also confesses his sins. All in all, it is a beautiful example for us to learn from. The ascription to Psalm 51 reads, "For the director of music. A psalm of David. When the prophet Nathan came to him after David had committed adultery with Bathsheba." I take it that this indicates David's authorship of the Psalm. If so, herein lies a story of humble origins, a rise to glory, self-indulgence, moral corruption, and finally David's restoration to the God that he loved. From boyhood David has loved God. His is a humble life, eighth son in a family of brothers who don't take him seriously. On the hillsides as a shepherd boy he composes songs to the Lord and sings them until the mountain crags echo with praises. But then his life takes a turn. He is called to King Saul's court to sing soothing songs to a troubled monarch. Then he kills the Philistine giant Goliath with a stone from his shepherd's slingshot and vanquishes the Philistine army that had oppressed the land. Now a military leader, he leads soldiers to fend off Philistine attacks against Israel. The common people sing, "Saul has killed his thousands, but David his ten thousands," and Saul, in jealousy, begins to fear and hate him. David runs for his life, and hides out for years in the rocky fastness of the wilderness and later among his enemies, the Philistines themselves. Saul is finally killed and David exalted as king. He begins as a righteous ruler, but power and wealth take their toll on his moral compass. One day from the height of his palace, he watches as Bathsheba, wife of Uriah, one of his loyal warriors, bathes on her rooftop. In lust he calls her to the palace and gets her pregnant. When he can't blame her pregnancy on her husband, he has her husband killed. Now outwardly righteous, but inwardly corrupt, he is far from God. But God is not far from him. One day God sends Nathan the prophet who tells him the simple story of a poor man being cheated by a rich man out of the little ewe lamb that he loves. Enraged, David says, "The man deserves to die." Nathan lifts a bony finger, points directly at the corrupt King, says with an even voice, "You are that man," and pronounces the Lord's judgment upon him. This shocks David out his denial and cover-up. Then David said to Nathan, "I have sinned (hātā�) against the LORD." The Lord punishes David for his sin, a Father's stern discipline you might call it, but he forgives the sin that had become a wedge between David and his God and restores him to fellowship. The Lord draws him close and David, now chastened, responds. Now let's look at it section by section. This self-revelation is not just a single occurrence. Throughout the Old Testament and the New, God is known as the God of mercy and compassion. (See for example: Psalm 86:15; 103:8-10; 145:8; Joel 2:13; Numbers 14:18; Deuteronomy 4:11; Nehemiah 9:17; Micah 7:18.) He is the God who disciplines his children but also forgives and restores them. Some people think the angry God of the Old Testament is vastly different from the loving Father of the New, but they are wrong. God shows his anger against sin in the Old Testament and the New, but is known above all for his mercy. So David calls upon God's mercy as his sin lies exposed before God. "Mercy" (hānan) means "be gracious, pity � a heartfelt response by someone who has something to give to one who has a need." Here it is a plea to Yahweh to "be gracious to me. "1 David asks for this mercy in accordance with (that is, on the basis of) God's well-known character qualities of steadfast love and compassion. "� Blot out my transgressions. This is Spirit-inspired poetry, so in keeping with Hebrew poetic style of synoptic parallelism where two or more lines repeat the same idea, David makes his request with three synonyms for forgiveness and three synonyms for sin. We'll look at some synonyms for sin in a moment. But, first, I am fascinated by the synonyms for pardon. "Blot out" (māhā) means "wipe, wipe out. "5The word is used for blotting out the inhabitants of the earth in the flood and erasures in ancient leather scrolls made by washing or expunging. Here and in verse 9 the word seems to suggest "removing a stain." "Wash away" (NIV, kābas) or "wash thoroughly" (KJV, NRSV) means "wash, be washed, perform the work of a fuller," that is "to make stuffs clean and soft by treading, kneading and beating them in cold water. "6The same verb is found in verse 7b: "Wash me and I will be whiter than snow." The stain of sin is deep and David recognizes his need for radical and deep washing. "Cleanse" (tāhēr) means "be pure, be clean." The word is used of wind sweeping the skies clear and the purifying of silver. It is used of moral purity as well as the ritual purity of the Levites and of holy vessels in the tabernacle.7The adjective formed from this verb is used in verse 10 where David asks for a "pure heart" or a "clean heart." David asks God for a full pardon -- and cleansing of his character -- based on God's merciful nature. It is a bold and very hopeful prayer prayed by a desperately wounded sinner longing to be restored to fellowship with his God. Q1. In what way does a prayer for pardon require faith? What is that faith based on? How does a person gain the faith to pray this prayer in confidence? David does not hide or minimize his sin. He owns up to it fully before God. and my sin (hattā�t) is always before me. sinful (hēt�) from the time my mother conceived me. I won't belabor the words for sin, but David uses a number of synonyms, each with a slightly different flavor and connotation. This isn't time to get into a full discussion of the doctrine of original sin. I don't think David is blaming his sinful human condition, that somehow he just can't help sinning because he is "only human." Rather, he is affirming that he is sinful through and through. He is acknowledging the awfulness of his sin in the clearest possible way by using these various synonyms of sin that describe its convolutions of rebellion, twistedness, missing the way, and wickedness. As long as we try to excuse ourselves, to rationalize our sins to make them seem somewhat less guilt-worthy, we haven't confessed our sins to God in the way that is necessary. We must own up to our sinful behavior, take full responsibility for it, call it what it actually is, and be sorry for offending God in this way. Then we are ready for grace, but not until. Does this mean that David's sin against Bathsheba and her husband Uriah were meaningless, inconsequential? No, not at all. But David recognizes that the greatest sin of all is against the Lord that he purports to love. When he sins, he is flaunting his rebellion in God's face. He is saying to God, who told him that murder and adultery were wrong, that he doesn't care. Yes, we can sin against people and need to make these sins right (Matthew 5:23). But our sin is even more against our heavenly Father. It is that breach that must be healed at all costs. Q2. In his prayer does David seek to minimize his sins? To maximize them? Why does an authentic prayer for pardon require clear, unvarnished acknowledgement of sin to be effective? David has painted his iniquity in clear colors. Now he begins to contrast his own sinfulness with what God desires. He looks within. Sinfulness is not primarily in one's actions, but in one's heart. In verse 6a David speaks of "the inner parts" (NIV), "the inward parts" (KJV), "the inward being" (NRSV). The Hebrew word tūhot describes an object "covered over, hidden, or concealed," carrying the idea of the inner being of a person covered up by the body.12The parallel idea in 6b is of an "inmost place" (NIV), "hidden part" (KJV), "secret heart" (NRSV), from the word sātam, "stop up, shut up, keep close. "13In the New Testament Paul talks about the "inner being" (Romans 7:22), the "new self" (Ephesians 4:24; Colossians 3:9). Peter uses the expression of "the inner self" (NIV, 1 Peter 3:4) or "the hidden man of the heart" (KJV). So David calls out for "truth in the inner parts" and "wisdom in the inmost place" (51:6). "Cleanse me" translates a word that denotes a cleansing or purifying ceremony during which sin is done away with.14Hyssop is a small plant that grows on walls, probably marjoram in the mint family. 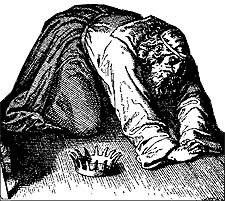 It was used in purification ceremonies to apply blood and water.15David is calling upon God himself, not just a priest, to cleanse him through and through to remove his deeply ingrained sin. If God cleanses him, if God washes him, then he will be "whiter than snow." Being separated from God by sin brings pain in one's spirit, a sense of guilt and estrangement. Contrary to those who cynically perceive Christianity as a guilt-driven religion, God doesn't desire us to live with guilt, but to enjoy forgiveness and full fellowship with him. Here David prays for joy to replace his misery and "the bones you have crushed." In verse 12a, the word "restore" (shûb), "turn back, return," carries the idea of "give back, restore"16David has known the joy of God's salvation and rescue before. Now he longs for this joy in fellowship to be restored to him once more. It is his earnest prayer. Have you lost the "joy" of your salvation? Have you become somewhat distant from God? Have you taken God for granted? Or perhaps have you never really got to know him? God wants to restore the joy to you that is your birthright as a Christian. Joy is a fruit of the Holy Spirit's work in your life (Galatians 5:22-23). Call out to him in repentance and receive the joy God desires for you. Now David prays for a pure heart and a willing spirit. David uses two interesting words in his prayer in verse 10 -- "create" and "pure." "Pure" (NIV, tāhōr) or "clean" (KJV) comes from a verb we saw in verse 2, "to cleanse," which is used of ritual or moral purity and of the pureness of the unalloyed gold of the temple furniture. The temple chambers which have been defiled (Nehemiah 13:9) are purified.18Now the word describes the heart David longs for. But isn't he asking for too much? David has been a slave to lust, drunk with power, stained by murder. How can he now pray for a pure heart? Isn't it too late? No. Can we be pure again once we've been corrupted? Yes. In verse 12b he prays for a "willing spirit" (NIV, NRSV) or to be upheld by God's "free spirit" (KJV). The adjective nādīb, "noble, willing, inclined," is from the root nādab, "make willing, incite, an uncompelled and free movement of the will unto divine service or sacrifice. "21Oh, for a spirit that longs to serve God, a heart that is inclined to him! Q3. Is it possible to have a pure heart? How does God bring about a pure heart? What is our part in this? The Spirit of God had left Saul and come upon David. So David is terrified that in his sin this would happen to him as well, that God's Spirit will desert him. But he repents and trusts God for the answer to his prayer. Now David looks forward to the answer to his prayer and how he will serve God. Restored and forgiven, he sees himself once again serving the Lord -- teaching, singing, praising. Note that he is not bargaining with God, but anticipating and promising to God what he will do. I don't see this so much as a vow but a vision of the future. Now David compares true repentance to ritual sacrifice. You find this theme among several of the later prophets, as well. what are they to me?' says the LORD. We Christians also have developed rituals through which we can be absolved from sin. It may be formal confession and absolution by a priest or pastor, or by praying a particular prayer. Confession is important in this process (James 5:16). But whatever shape it takes, God is not looking for outward religious action but for heart repentance and change. In Psalm 51, David fully realizes and celebrates this fact. "The sacrifices of God" (NIV, KJV) or "The sacrifice acceptable to God" (NRSV) could also be translated, "My sacrifice, O God" (NIV, NRSV footnote). "Broken" (shābar) is used figuratively here of a broken heart. Until our hearts break with sorrow at our sin, we are not quite ready for forgiveness. So often we are sad at being caught or exposed, but not sad at hurting the God who loves us or injuring his reputation by our sins. Nathan had told David that his sin had "made the enemies of the LORD show utter contempt" (2 Samuel 12:14). Many conversions these days seem to lack the deep repentance that rends the heart (Joel 2:13). It is not religion, but a relationship that has been injured and must be restored. "Against you, you only, have I sinned and done what is evil in your sight, " David cries (51:4). Oh, that our sins would break our hearts! Q4. What does it mean to have a broken heart and spirit? Why is this essential in the prayer for pardon? In what sense is this a "sacrifice"? Why do we tend to resist a "broken and contrite heart" in ourselves? The psalm concludes with a prayer for Jerusalem. What do we learn from this Psalm about the prayer to God for pardon? A prayer for mercy. He doesn't owe us forgiveness. He offers forgiveness by grace, based on the death of Christ for our sins. We can't bargain for it or promise great deeds in exchange. It is so utterly expensive that it cannot be bought by our promises of future good deeds. It is mercy, pure and simple. A prayer for pardon is a prayer for mercy. A prayer from a broken and contrite heart. Repentance -- confessing our sin, being sorry for it, and turning from it -- is necessary to pray the prayer for pardon. A prayer for inner purity. In addition to pardon, we are asking for a cleansing of our flawed character so that our hearts might be pure before God. An outward cleansing isn't enough, for God sees the heart and the heart must be changed. A prayer for the joy of salvation. When God lifts our sins from us, joy is the result. Our prayer for pardon seeks the joy of unobstructed fellowship and restored access to the presence of God. A prayer to tell others. Our prayer for pardon results in a desire to tell others of God's great mercy, a desire to witness to others of God's forgiveness. Ultimately, the prayer for pardon is a prayer of faith that our Father will restore us. I've often wondered if Judas could have been forgiven. This side of heaven we don't know the answer. But to the best of our knowledge his faith didn't reach out for forgiveness, but languished in the belief that God could not forgive him. Dear friends, there are many people today who believe God will not forgive them for what they have done. Perhaps you feel this way. David's prayer for pardon is a mighty testimony of the mercy of God and our ability to come to him in prayer when we have sinned. This is very good news to the hopeless and the lost. Share the good news of the prayer for pardon and the God who made a way to forgive. Father, so often we sin and need to run back to you and say we are sorry. Teach us to keep short accounts with you. To quickly come and pray the prayer for pardon to you that we might be restored to you. Thank you for the love and sacrifice of Jesus that made all this possible. In His holy name, we pray. Amen. Edwin Yamauchi, hānan, TWOT #694. For example, N.H. Snaith, The Distinctive Ideas of the Old Testament (Schocken, 1964), pp. 94-130. R. Laird Harris, hesed, TWOT #698. Leonard J. Coppes, rāham, TWOT #2146a. Walter C. Kaiser, māhā, TWOT #1178. KB, p. 422, cited in John N. Oswalt, kābas, TWOT #946. Edwin Yamauchi, tāhēr, TWOT #792. G. Herbert Livingston, pāsha�, TWOT #1846a. Carl Schultz �āwā, TWOT #1577a. G. Herbert Livingston, hātā�, TWOT #638e. G. Herbert Livingston, rā�a�, TWOT #2191a. Ralph H. Alexander, tûah, TWOT #795b. The verb hātā�, which means "sin, miss the way" in the Qal stem, means in the Piel and Hithpael stems "to make a sin offering" or a cleansing or purifying ceremony during which sin is done away with. G. Herbert Livingston, hātā�, TWOT #638. See Exodus 12:22; Leviticus 14:4-6, 49-52; Numbers 19:6, 17-19; Hebrews 9:19; John 19:29. Herbert Wolf, �ēzōb, TWOT #55. Shûb, BDB 999, Hiphil 1d. Thomas E. McComiskey, bārā�, TWOT #278. A different synonym for "create," is yāsar, which suggests "to fashion, to shape something new." Edwin Yamauchi, tāhēr, TWOT #792d. Carl Philip Weber, hādash, TWOT #613. John N. Oswalt, kûh, TWOT #964. "The root meaning is to bring something into being with the consequence that its existence is a certainty." Leonard J. Coppes, nādab, TWOT #1299b. Bloodguilt (dām, "blood") was the sin of shedding innocent blood, considered a mortal sin. In David's case, he had ordered the death of Uriah, Bathsheba's husband. TWOT #436; BDB 197, g.
Herbert Wolf, dākă, TWOT #428. Marvin E. Tate, Psalms 51-100 (Word Biblical Commentary, Vol. 20; Word, 1990), pp. 28. So Derek Kidner, Psalms 1-72 (Tyndale Old Testament Commentaries; InterVarsity Press, 1973), p. 194; and Tate, Psalms 51-100, pp. 29-30. Franz Delitzsch (Keil and Delitzsch 5:141-143) defends Davidic authorship of these verses.